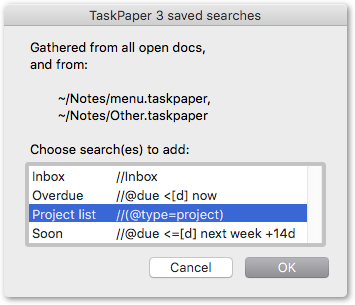 My workflows happen to use a number of TaskPaper files (different projects, different days), and whenever I start a new file, there are usually one or two existing @searches which I want to paste in from other TaskPaper files. One or more default TaskPaper files which you can list in the macro. It offers a menu (without duplicates) from which you can choose which @searches you want to paste into the active document. You could also do something like this with TaskPaperRuby.